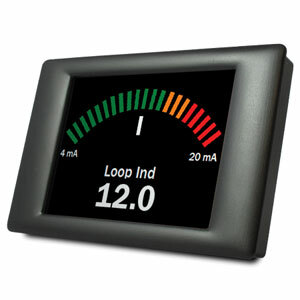 The OM-SGD Series is a family of panel meters with smart graphics display. Using the simple wizard based configuration software you can select from any of over 40 standard display configurations to start with. Users can then customize colors, text labels, input scaling and units before uploading the selected display configuration to the meter via USB interface to the PC. The configuration software is compatible with Windows® XP (SP3), Vista, 7 and 8 and can be downloaded free online at OMEGA. Each of the three display sizes 61, 71, 89 mm (2.4", 2.8", 3.5") is available as either a dual voltage input model or 4 to 20 mA input model. Waterproof NEMA 6 (IP67) rated versions of the 2.4" display are also available. A thermocouple add-on board is available for use with the six standard meters. The thermocouple add-on board is not compatible with the waterproof versions (OM-SGD-24-M-IP, OM-SGD-24-M-IP420). This will measure temperature via any Type J, K or T thermocouple. Nota: Comes complete with quick start manual. Waterproof models OM-SGD-24-M-IP and OM-SGD-24-M-IP420 include 32 mm mounting nut and IP67 connector. All other models include panel mounting clip. USB interface cable is required for programming and is sold separately.